Greene (population 1,130) , located in north central Iowa, has been affected by major flooding in recent years, including 2008 and 2016. The community applied to the visioning program in search of ideas for flood mitigation and river enhancements, improved walkability/bikeability in town, and trail development. The transportation assets and barriers assessment revealed that despite flooding issues, the Shell Rock River is an important asset on which residents would like to further capitalize. People also value old Highway 14 as a walking route, but would like more amenities and a longer route. Outdoor recreation opportunities in general are important to all demographic groups in Greene. Barriers identified during focus groups include poor lighting along the streets near the high school; lack of accessibility in Perrin Park, downtown, and at the school; and poor access to old Highway 14. Safety – Repair and add new sidewalks, improve lighting, and install crosswalks and additional signage in key areas of town. 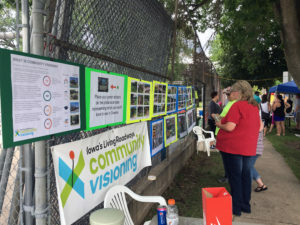 Recreation – Connect popular walking/biking routes to create longer routes and more opportunities for exercise, add amenities to old Highway 14, improve accessibility in Perrin Park, and create an ADA-accessible playground in the FEMA buyout lot. Tourism – Install way-finding signage to boat ramps and river access points, install community map panels directing visitors to other population destination, implement a water trail designation along the Shell Rock River, and create a river-themed signage. 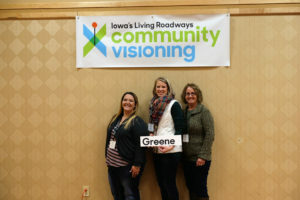 Today Emily, Sue and Jami attended the Iowa Living Roadways Community Visioning Kickoff Event at the Gateway Center in Ames. We had the opportunity to meet with the other towns that will be going through the Visioning process in 2017 as well as all of the staff from Trees Forever, Iowa Department of Transportation and Iowa State that will be working through the process with us.